i might have guessed that my 8th stitch fix would turn out to be my number one stunna, just because 8 is (obviously) my totem spirit number. but i DIDNT guess, therefore this was even more fun because i didnt see it coming. 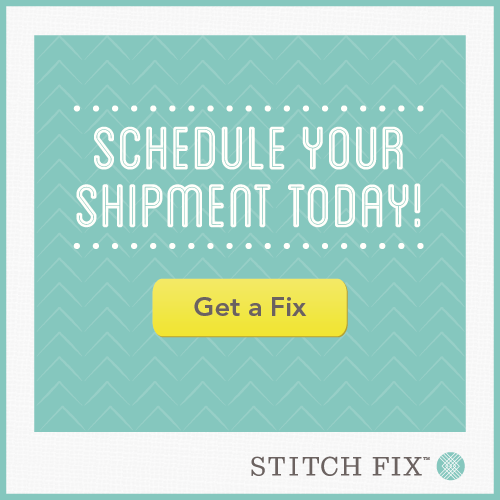 yall, stitch fix is ON. THEIR. GAME. i was feeling blah about them there for a while last summer, but they have done nothing but impress me since. i feel like their inventory is better AND they know me, my style, and--dare i say it?--my body (ooh la la), so much better now. they have LISTENED to my feedback and made awesome adjustments. i feel this side-view of the stack just LOOKS like me! a great sign. ah! a peachy-coral chevron top! the granny buttons make me nervous, but i am excited to get a chevron statement piece for my body since i declined putting them all over my wall. i am digging the color. 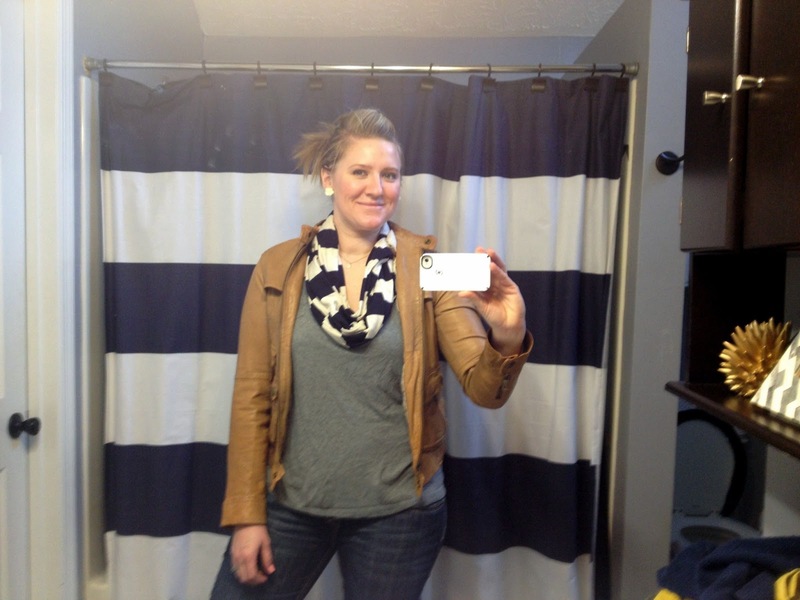 a soooooper long heathered cream and navy striped scarf. i know i will sew this one into an infinity scarf (and remove the great honking tag) if i keep it so that's why i showed it this way. love it immediately. willing it to be worthy. a fun dots n' stripes top with some cool sleeve and neckline action. think it's totally gonna be a winner. okay. into the clothes i go! didnt have time to really get gussied up and think hard about the styling of these, so it's just simple ensembles and post-workday hair/makeup this time. if the clothes can work on this, i'll know they're winners. oh, hey, what do you know? i just so happen to have a visually interesting cardi that could use a cute underlayer that doesnt compete with it (thank you fix #7!) ! i went full bore on the triangle theme. digging this, but the hem tapers a bit and is not elastic, and it's a little tight on my hips. hopefully my hips will soon be yielding, but in the interest of clothes that fit me NOW, i asked if they had a large. they did and i got it! (free shipping on my alternate sizes). the medium is pictured. at this point we are 2 for 2 and headed into unprecedented stitch fix territory. 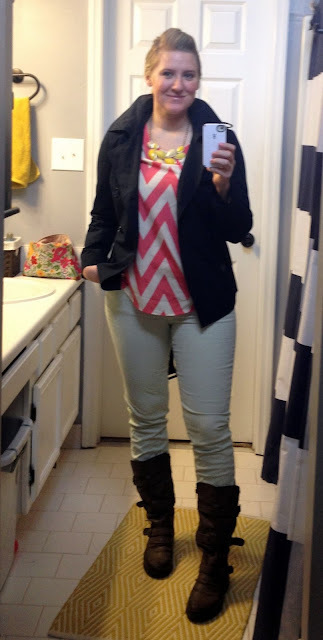 the most i have ever kept was 2 items out of 5.
i tried to recreate a spin on the outfit i put together for my tide post with my boots, mint jeans, yellow necklace and navy F21 trench ($13!!!). i really like this look and the top especially, but the medium is a little tight on the bust and tends to squash me there and/or ride up (as you can see happening above). why, no i am NOT pressing up against an invisible pane of plexiglass. why do you ask? last is the dots n's stripes top featured in a horrible picture. i wanted to love this but it just kind fell flat on me. its a dressy fabric, but the cut and style come off casual and so it was kind of clashing for me there. okay so this post-game decision-making required a little thinking. more accurately, it required an excel spreadsheet where i ran through the scenarios of keeping 2, 3, 4,or 5 items. i knew that i was keeping at least the first two, wanted the scarf too, would feel great in the chevrons soon and then would maybe keep the dots/stripes just to get the discount and could sell it or give to a friend. after running the numbers i decided to...KEEP EVERYTHING! 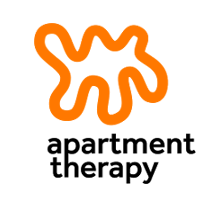 the dots top that i wasnt in love with ended up being essentially free once it kicked in the 25% off everything discount as the 5th item. 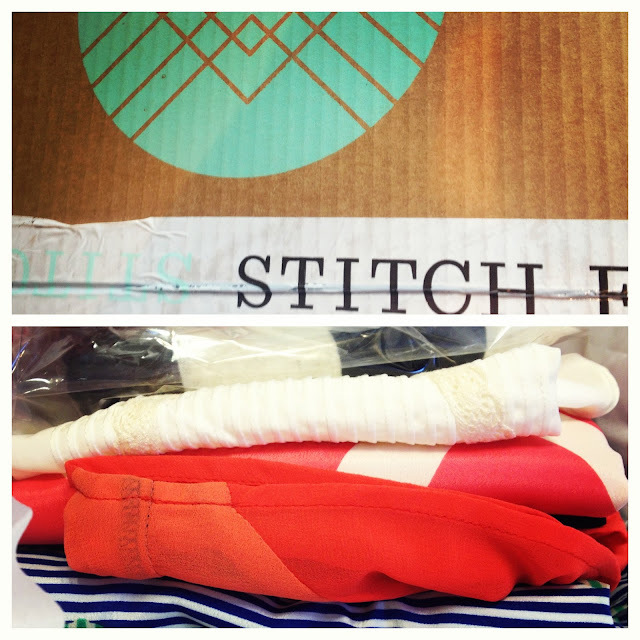 i am just so buzzed to have joined the keeper club (fictional...just made that up) of stitch fix! it feels awesome to have gotten 5 outstanding pieces that are pretty unique and all for less than $200 (for 3 blouses, a dress, and an awesome scarf from boutique labels, i call that a win). i usually like to ask yall what i should keep and reveal my choices later, but i left you hanging so long last time, that i had to get it all out there this time. but what do you think? did i make the right choice? what would you have kept or had me keep? Oh OH OH! 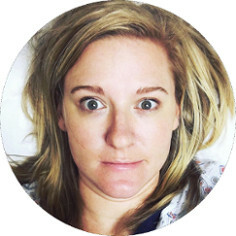 I am a medium and I love it! I was just thinking, wonder if I could request this top from them?! If you tied a belt around the last top, it would give you more shape OR throw it over the edge to ridiculous-town! Worth a shot. Cute fix! YES!!!! I agree with everything you said. 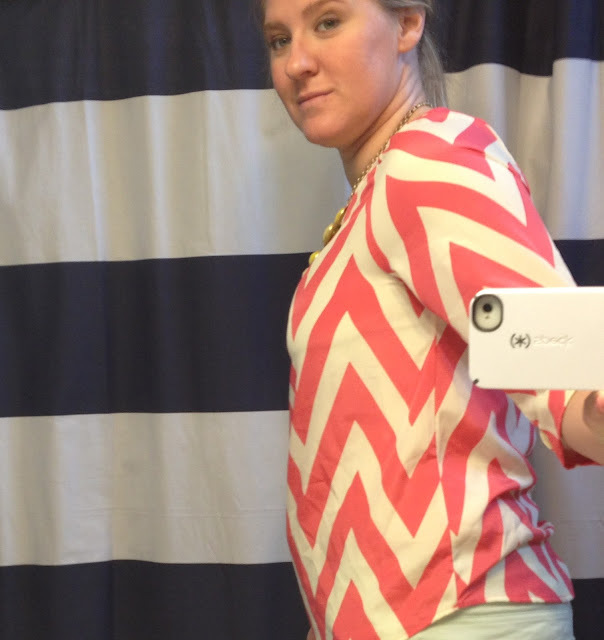 You can always change the buttons on the chevron top but it's a keeper anyway. And I'd have done a bit of maths to figure out what to keep/cost too :-) You can always ebay the last one if you're not sure about it, even when you get to your healthy weight. 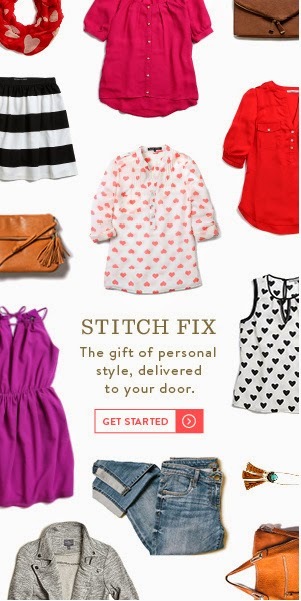 Woop well done Stitch Fix! LOVE them all. I so wanted stripey-dotty to look good on me, too. And that dress, holy hottie! The chevron top looks so nice! The best deals for one-of-a-kind and non-exclusive blog designs! Enter our blog design Giveaway! My name starts with M and I like that top! green and navy are my colors. Love the fix and you are looking great! Cute stuff - way to join the "keeper club!" I think your first look is my fave. Love all the triangles. Lovin' that dress too! 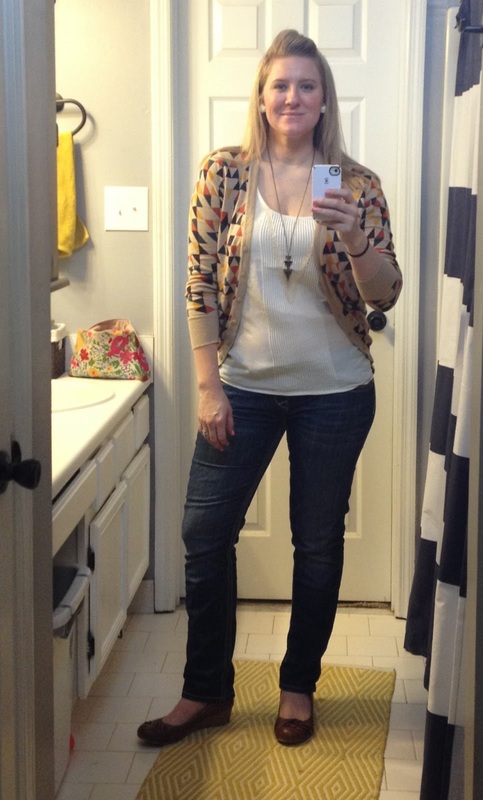 I decided to give up on StitchFix (at least for now!) - just wrote a blog about how I'm happier/less poor when I shop with my first true loves (Target and Old Navy). This was an AWESOME fix! And that dress is officially your hotness go-to. Also? I got that cream tank a few weeks ago and it was a no-brainer for me too. And now Hazel is calling me, so cutting this tender comment short... xoxo!!! I LOVE that dress, its adorable, Perfect for bbq's or weddings. I love them all too!! Dress and Dot shirts are my FAVE! The blue looks wonderful on your complexion!